Tokuriki, Tomikichiro "Shiba Zojoji Temple" - Woodblock - Chinese and Japanese woodblock prints for sale, silkscreen, scrolls, watercolor, lithographs. 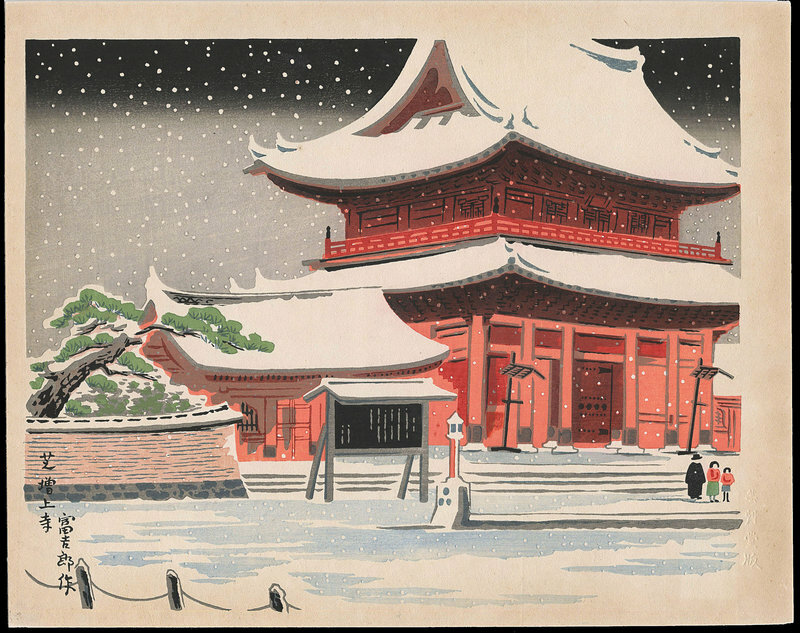 Artwork Details for Tokuriki, Tomikichiro "Shiba Zojoji Temple"
Condition: Print: Very Good impression and condition. Full margins. No tears, creases, folds, or stains. Natural age toning and some faint spotting. Gorgeous strong embossing to snow and other structures. Unsodo publisher stamp on verso. Folder and folder cover have foxing marks. Notes: This print is from a rarely seen pre-war series that was only published as a first-edition. The print comes in its original matching folder and folder cover (see below). The folder contains a detailed explanation of the print's scene in Japanese. Print title and Tomikichiro signature at lower left of image. This print was published by Unsodo; evidenced by the embossed publisher's seal at the bottom of the right margin.